A ‘BROKE’ millionaire art collector has insisted her Malaga collection is safe. Carmen Thyssen (Cervera) said that no paintings from her eponymous museum in the city will be sold to help resolve her continuing financial difficulties. Her assertion comes after it was revealed she was looking to sell Edgar Degas’s Race Horses in a Landscape which currently resides in the Museo Thyssen-Bornemisza in Madrid, where she is also a patron. “I’m not thinking about touching the paintings in Malaga,” Thyssen told Diario Sur. “From Malaga I’m not going to take anything. She added weight to her claim by saying she had given more paintings to the Malaga museum since it opened, despite not having any obligation to do so. Last week, Malaga Council’s PSOE party tried to pass a motion to include an indemnity clause, should Thyssen try withdraw her works or funding from the museum, but it was blocked by opposition parties PP and Ciudadanos. 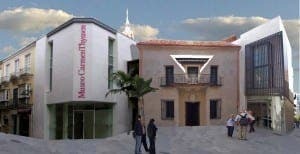 The city council has a 15-year contract until 2026 with Thyssen regarding the Malaga museum, which opened in 2011 and houses mainly 19th century Spanish art. Although it lacks an indemnity clause, it contains three clauses which only allow Thyssen to withdraw a maximum 10% of the collection, loan works temporarily or place them in the permanent collection of other museums.